Fits doors 1-3/8" to 1-1/2" thick. Pre-assembled for doors opening left to right. Plates are reversible for doors opening right to left. 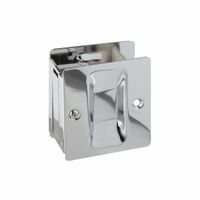 Overall size: 2-3/4"H x 2-1/2"D. Johnson Pocket Door Pull, Dummy, Suitable For Use With: 1-3/8 in Door Thickness, 2-1/8 in Diameter, Bright Brass Plated Fits 1-3/16" center to center double "J" track systems. 1" diameter plastic wheels. Adjustable bracket is designed to mount on top of door. Convex roller edge. 4 nylon wheels; spring-loaded; steel bracket; adjustable up to 3/8" height; for pocket doors 1" to 1-3/4" thick; up to 100lbs each. Convex roller edge. Reversible handings with pull-out edge tab. Will fit 1-3/8" thick doors only. Mortise installation. For joining two Johnson 2000 pocket door frames. Kit includes: (2) 2055 track stops, (1) top plate, (1) bottom plate and mounting screws. Size: 3-7/8" x 3/4" x 1-5/8". Slim pak - polybagged. Hardware kit for 1500 series pocket door frames includes: No.1120 hanger, No.1513 bumber, No.1550 guide, No.1712 adjustment wrench and screws. Mortise latch unit with privacy lock feature, and pull-out edge tab. Reversible; fits 1-3/8" thick doors. Latch engages and disengages by rotating round thumb turn. 1-3/8"W x 2-3/4"H.
Solid brass faceplate. (2-1/2"L x 2-11/16"W). Adjustable for 1-3/8" or 1-3/4" doors, without the need for special screws. Coined edges eliminate bowing of faceplate. Curved zinc die cast finger pull. Inner working construction eliminates jamming of lock. Fits doors 1-3/8" thick. Designed with latching mechanism to lock door. For safety purposes, door can be unlocked using screwdriver. Sliding door combination pull for passageway (pocket) doors; reversible; adjust for 1-3/8" to 1-3/4" door; plates are polished solid brass. Latch engages and disengages by rotating round thumb turn.